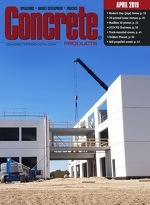 Concrete Products - Your Leading Source for concrete technical news. Precast concrete products were on the agenda of the 99th annual Transportation Research Board meeting in January in Washington, D.C. Over 12,000 delegates heard presentations in 800-plus sessions addressing multimodal transportation policy and construction practice, including materials and design involving precast/prestressed products. Concrete Products was there and we present this report on new research in precast structures and methods. We will look at TRB 2019 research in cast-in-place concrete later this year. The 100th meeting of TRB will take place January 12-16, 2020. For more information, visit www.trb.org. The annual Transportation Research Board meeting in January is one of the highlights of the pavement and bridge research community. This year’s event drew over 13,000 transportation engineers and specialists from the United States and other countries to Washington, D.C. Delegates could audit 5,000-plus presentations in over 800 sessions addressing topics in transportation construction, including projects based on precast/prestressed concrete structures and methods. Concrete Products was there and this month presents a report on new research findings in precast/prestressed research at TRB 2018. We looked at ready-mixed and cast-in-place concrete previously, see March 2018, pages 54-57. For more information, visit www.trb.org. The 97th annual meeting of the Transportation Research Board in January drew 13,000-plus transportation engineers and specialists from across the country, and around the world to Washington, D.C. More than 5,000 presentations in over 800 sessions addressed topics in multimodal transportation, including materials and design involving ready mixed concrete and precast/prestressed products. Concrete Products was there and this month presents a report on new research findings in cast-in-place concrete. We’ll look at precast/prestressed related research from TRB 2018 in an upcoming issue. For more information, visit www.trb.org. The decline in coal for energy has reduced available fly ash supply to the concrete industry and generated a significant increase in finished product variability, which has led to a sharp rise in material costs for high profile projects such as One World Trade Center, New York City. Technical papers involving accelerated bridge construction and precast/prestressed concrete products were among the 5,000-plus presentations in more than 800 sessions at the 96th annual meeting of the Transportation Research Board. More than 13,000 transportation engineers and specialists from across the country—and around the world—journeyed to Washington, D.C., earlier this year for TRB 2017, and Concrete Products was among them.